Valentine’s Day is less than a week away, friends! So if you’re a little behind on your Valentine’s plans, or you’re just really feeling like you should make a fancy cake, then you’re in the right place. This cake is two layers of rich, dark chocolate cake with super creamy vanilla frosting on top. And as you can see, there’s a surprise layer of cherries and cherry frosting on the inside! 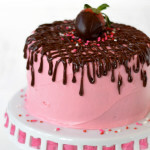 Valentine’s Day should be full of nice surprises, and that should totally apply to cake. I shouldn’t have bought this insanely cute, heart-shaped cake pan at Target because I think I might already have one. But when I was in the store I honestly couldn’t remember if it made the move to my apartment with me, and so now here we are. Heart cake! For this cake, I adapted my favorite chocolate cake recipe, which is this Black Magic Cake that I originally posted on my previous blog. I swapped out the cocoa powder for Hershey’s Special Dark cocoa powder, and I left out the coffee. The Black Magic Cake batter is thinner than most cake batters, so leaving out the coffee and just sticking with buttermilk makes it a little thicker and denser. But still rich, chocolaty cake. I also threw a little Greek yogurt in there for moisture. I loved the idea of adding cherries to the middle frosting layer of this cake, but could also see that going extremely wrong. 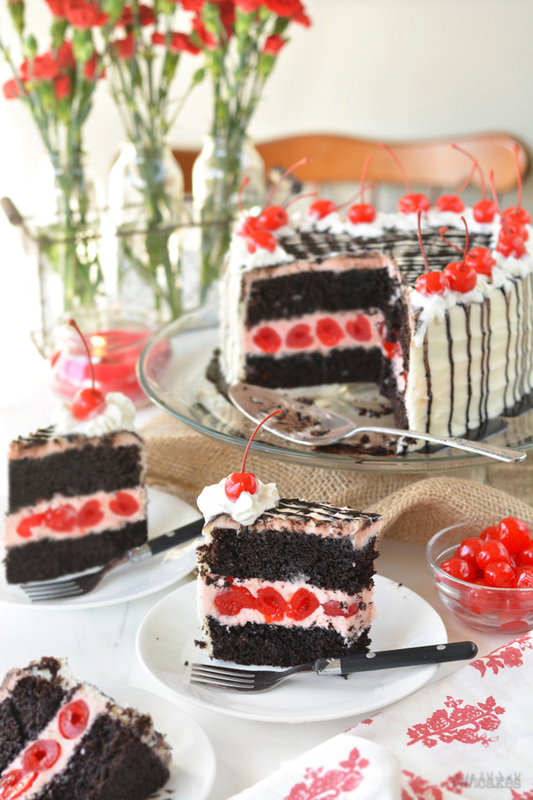 Like cherries everywhere and cake layers sliding all different ways. 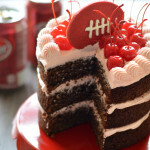 But I think the key is spreading on a thin layer of frosting and pressing the cherries down into it a little bit. Then add dollops of frosting all over the top of the cherries and carefully spread it out and press it down between the cherries. 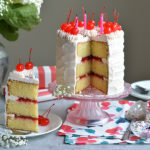 Once you’ve done that, add the second layer of cake, and spread frosting around the edge of the middle layer to really seal in those cherries. In addition to cake and cherries and frosting, I couldn’t not drizzle this white canvas of a cake with a little lot of ganache and swirls of whipped cream! What’s also great about this cake is you can ditch the ganache and whipped cream and just go with cake and frosting. Or you could leave out the vanilla frosting and use more cherry frosting. It’s really up to you! When it comes to cake, there are endless options and possibilities. Make it however you, or your sweetie, like it. 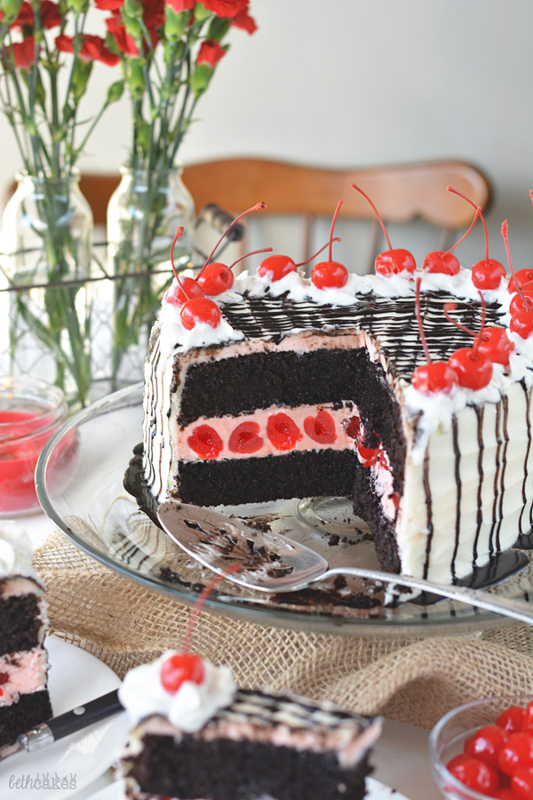 Two layers of rich, dark chocolate cake are covered in easy vanilla frosting and are filled with maraschino cherries and cherry buttercream. Preheat the oven to 350 degrees and spray two 8 inch (or heart-shaped!) cake pans with non-stick spray and line with parchment paper. 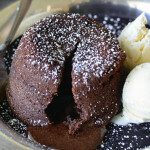 In a large bowl, combine flour, cocoa powder, baking soda, baking powder, and salt. Whisk to combine, then set aside. In another large bowl, combine sugar, eggs, yogurt, oil, and vanilla. Using an electric hand-held mixer, mix on medium low speed until fully incorporated. Add half of the flour mixture and half of the buttermilk. Mix on low speed until just combined. Then add the rest of the flour and buttermilk and mix until fully combined. Divide batter between the prepared pans and bake for 20-22 minutes, or until the centers are set and a toothpick inserted into the center of each cake comes out clean. Let the cakes cool in the pans for 10 minutes, then turn out onto a wire rack to cool completely. In the bowl of a stand mixer, or large bowl with an electric mixer, beat butter on medium speed until smooth and creamy. Add cherry juice and half of the powdered sugar. Mix on low speed until fully incorporated. 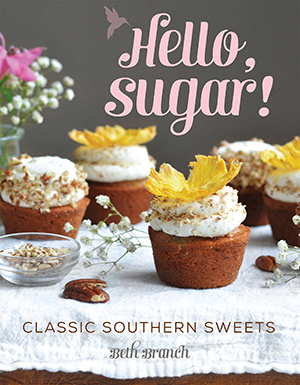 Repeat with the second half of the powdered sugar and continue to beat for one minute. Drain the rest of the cherry juice from both jars. Cover a cooling wrack or plate with paper towels and spread the cherries out to dry. Gently pat dry with more paper towels. In the bowl of a stand mixer, or large bowl with an electric mixer, beat butter on medium speed until smooth and creamy. Add vanilla extract, milk, and half of the powdered sugar. Mix on low speed until fully incorporated. Repeat with the second half of the powdered sugar and continue to beat for one minute. Place the chocolate in a heat-safe bowl. Heat the heavy cream in a small saucepan over low heat. Bring the cream to a slight simmer, do NOT boil. Pour the cream over the chocolate and let it sit for about five minutes. Use a small whisk or fork to stir until smooth. The ganache will thicken up as it cools, and let it cool completely. 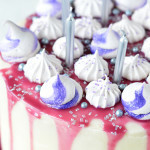 Place one cake layer on a cake plate or stand and spread with a thin layer of cherry frosting. Top the frosting with a layer of cherries, gently pressing the cherries down into the frosting. Cover the cherries with small dollops of frosting and gently spread it out while pressing it down between the cherries. Place the second cake layer on top and crumb coat it with the rest of the cherry frosting. (At this point, I put my cake in the freezer and made my vanilla frosting. You don't *have* to do this, but it makes frosting it a little easier.) Cover the rest of the cake with the vanilla frosting. I just used an offset spatula, but you could also pipe decorations if you'd like. 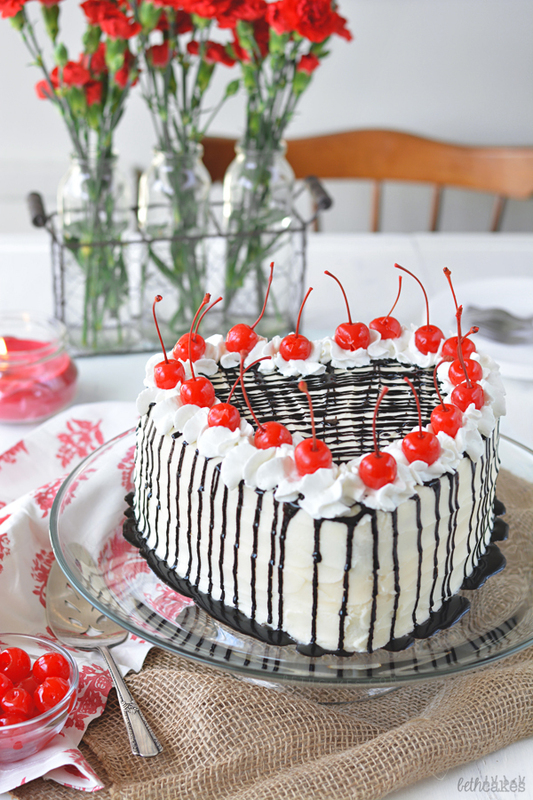 Drizzle the top of the cake with dark chocolate ganache and top with whipped cream and cherries! *To make this process easier and to cut down on time, you can make the cake layers the night before and cover them with plastic wrap. Then make the frosting the second day. This is so amazing! I would totally marry this cake…if that’s not too weird! This cake is a real showstopper! Whoever got to eat this masterpiece with you is a very lucky taste tester! Thank you, Nora! Let’s just hope my roommate and my coworkers don’t get tired of cake anytime soon, haha. Your photos are over the top! Just beautiful! Beth your cakes are always so pretty!! 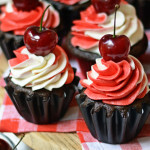 I love cherry and chocolate together – such a good combo. 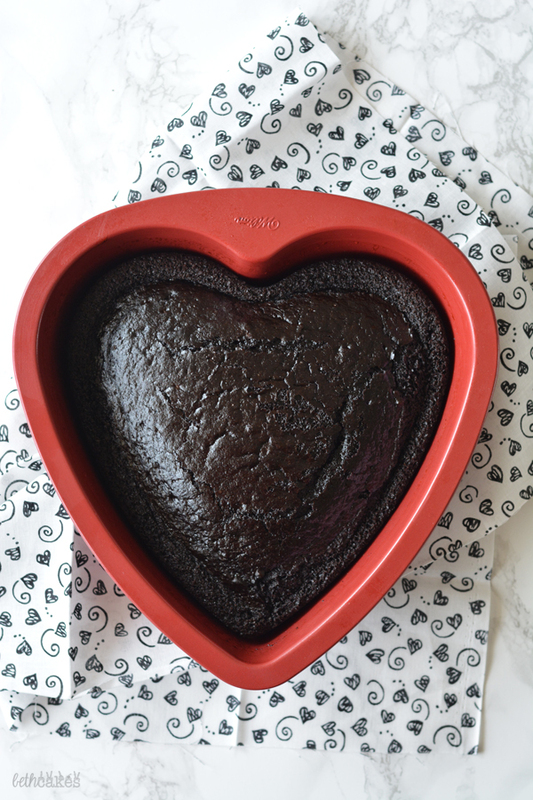 And that heart shaped pan … so so fun!! It’s a heart! That’s so cute. 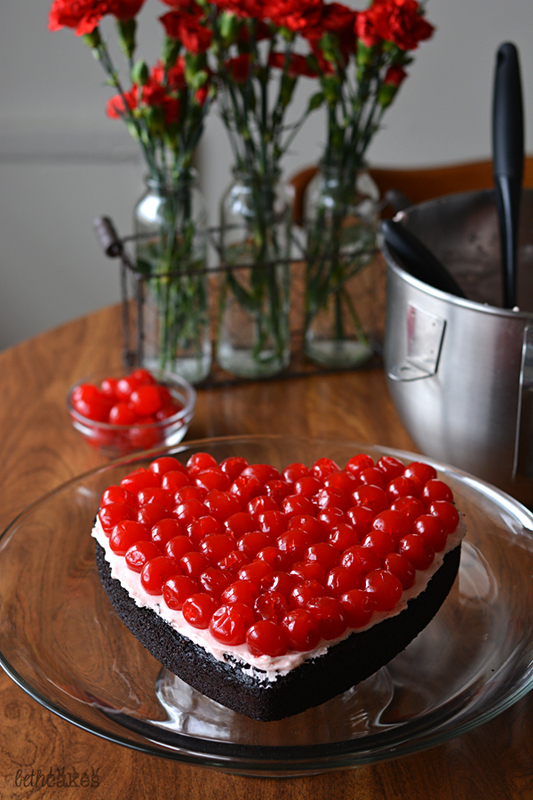 I need to get a heart pan, because I love this, and it sounds so so delicious with the cherries and ganache and that rich chocolate cake. Pinned! 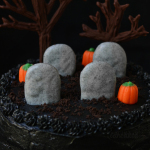 Oh my – this cake is totally amazing! I love the layers, the surprises inside, all the intricate details. The person you make this for will surely know they’re loved! This is the prettiest cake EVER!!!!! I love how you decorated this cake, Beth!